Although Asian audiences tend to be more interested in shows and live entertainment, that is not to say they are not also interested in theme park attractions. While E-Da does have its share of common flat rides, they do have some more unique attractions that ensure more than an hour wait on a good day. Outside of the attractions themselves, their operations are different than what one would find at a Disney, Universal or even Six Flags park. Located in the Santorini section of the park, 3D Ship of Souls is a walkthrough haunted house. The haunt itself is considerably elaborate and is similar in quality and experience to a haunted house at Halloween Horror Nights or Howl-o-scream. Visitors explore the bowels of a haunted ship to discover what happened to its doomed crew. Great detail is put into the sets, including the exterior while guests queue up for the experience. A dock with netting serves as the queue for the attraction as guests are funneled up a gangplank and unto the deck of a pirate ship. 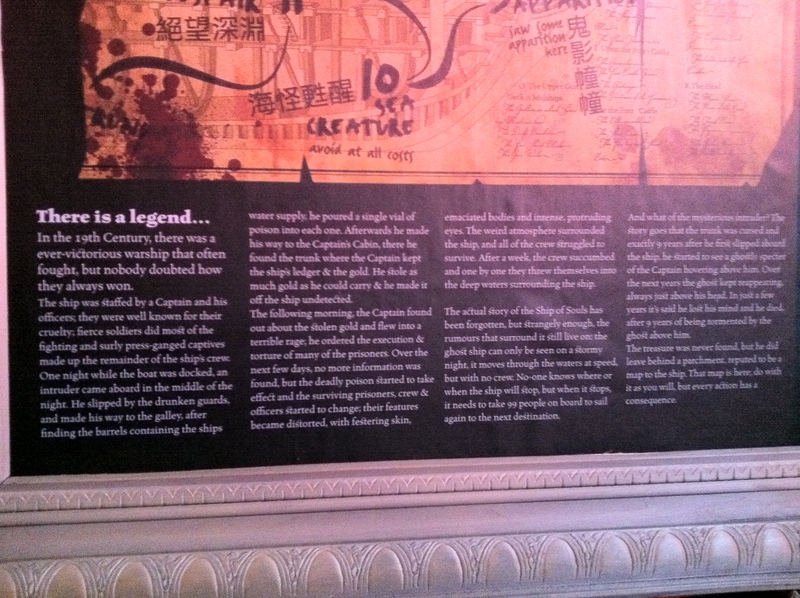 In the queue, signs hang telling the haunting story of the ship’s crew and a map depicting the journey the visitor is about to embark on through the bowels of the ship. 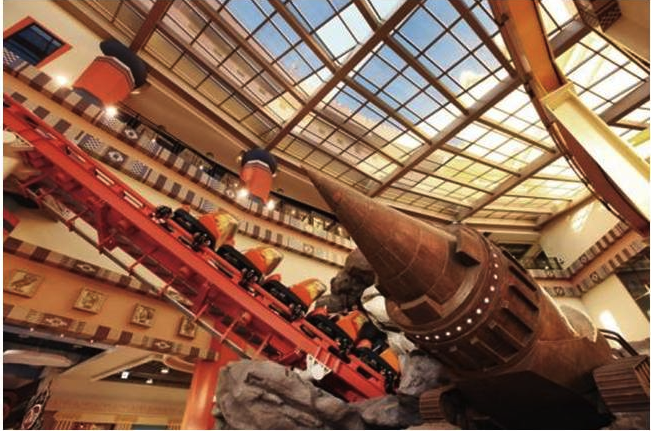 As mobile devices become more prolific, theme parks are using them to help guests plan their day, navigate and interact. Universal Studios Florida’s ScreenPlay app allows guests to point their mobile device at posters placed throughout the park to see short animated clips related to the poster. 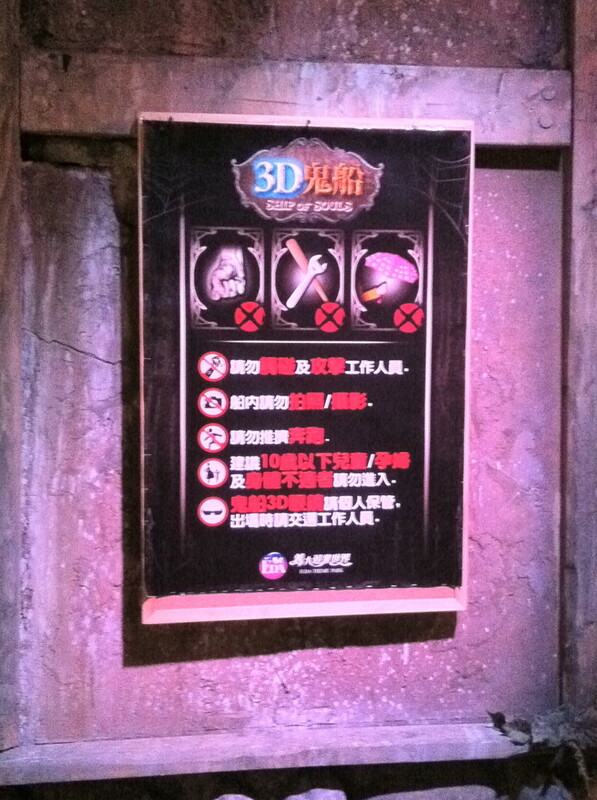 E-Da Theme Park has a similar app which visitors are encouraged to download the 3D Ship of Souls app. When the app is opened and pointed at a map hanging in the queue, a quicktime video pops up of a pirate telling the story of his fate. 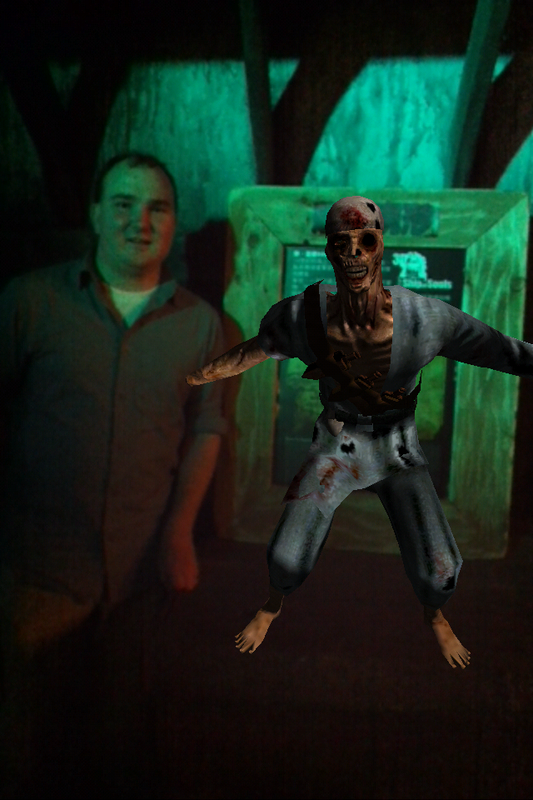 Additionally, a visitor may stand next to the map and a skeleton crew member will appear in the photo op. A final sign before approaching the ship remind visitors not to attack or punch the scareactors and also instructs that no blunt objects such as baseball bats, wrenches or umbrellas as they may be used to unintentionally hurt the performers. Before entering the house, visitors are given a pair of prism glasses which make the environment appear to glow with more light and shine. Instead of adding another “dimension” it makes the experience more disorientating to the visitor and therefore the possibility of being startled. This author wore the glasses for a total of 10 seconds before deciding to go without the ocular devices. 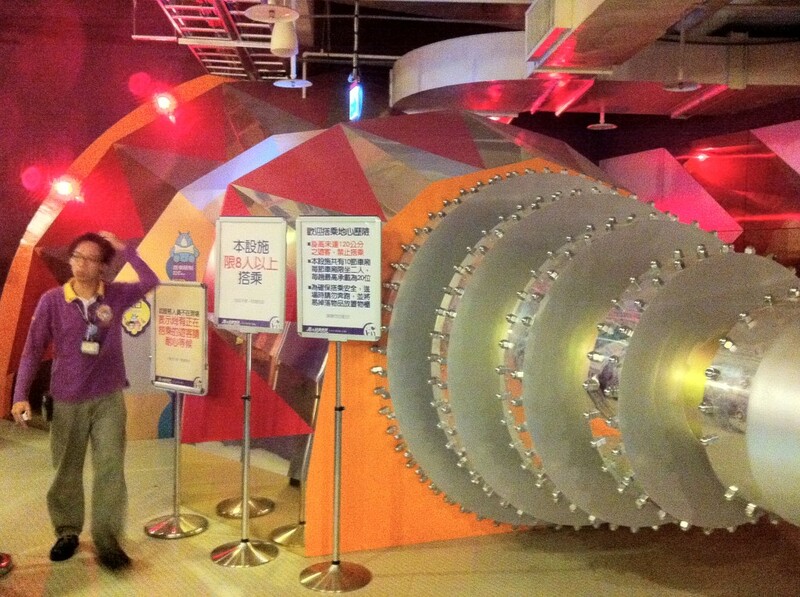 The total walk through experience lasts a good 3-5 minutes depending on how fast you walk. After acquiring the glasses, guests step on to the deck of the ship, surrounded by broken barrels and other nautical devices. The captain’s skeleton eerily clutches the helm rocking back and forth. We pass the grim figure and continue into the captain’s quarters, uneaten food, clothes laid out, and other evidence tells us the crew was not aware of what was about to occur. Exiting the captain’s quarters, we are back on deck, off the starboard bow a storm rages as we enter the body of the ship and into the prison. Restraints for prisoners and possibly rogue crew members line the walls. 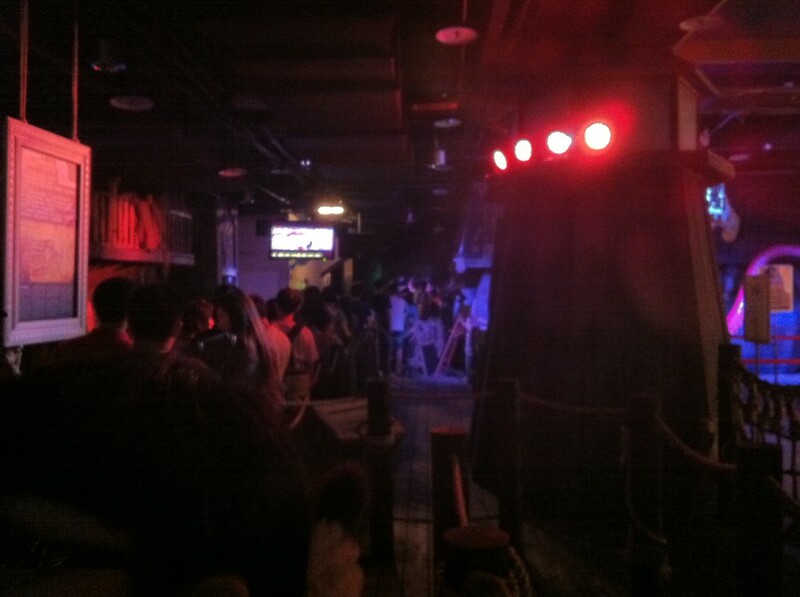 A skeleton hangs from one of the walls handcuffs distracting you as the first performer jumps out from the cell on the right. Fortunately, the bars keep them out of reach. 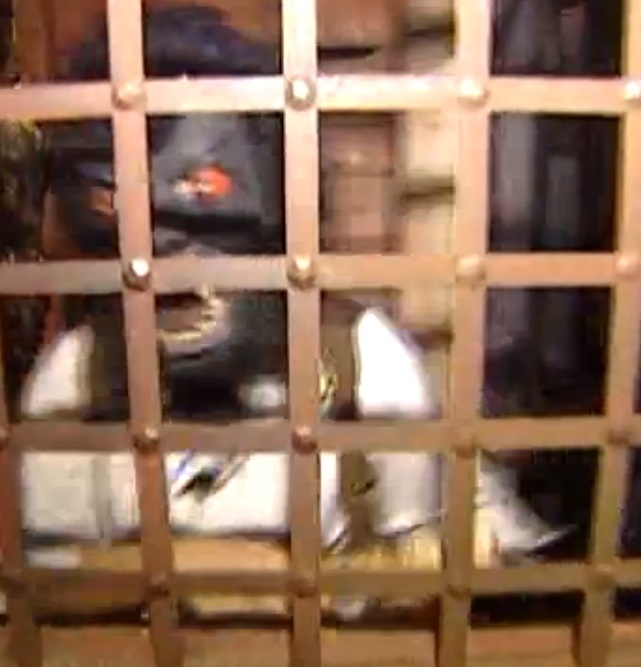 He wears a mariners outfit and an ape mask. Apparently not all the crew has died or disappeared, some transformed into odd beasts. The story out front explains how one night an intruder came onboard, stole the gold and poisoned the ship’s water supply. As the poison took hold, the crew began having strange reactions, boils and bruises, some jumped into the sea in agony, while others “vanished”. After passing through the prison, we enter the crew’s quarters which has gaping holes covered in neon paint to accentuate the effect from the glasses. As we enter we feel the floor shake a bit under our weight. It is a classic funhouse trick that is made more disorientating with the neon paint and glasses. We run into more half-human/half-creature performers jumping out from boxes, crates and sliding paintings. As we continue down the hall we pass several large tentacles reaching for us. Rounding the corner we see the large eye of an octopus. The tentacles wiggle back and forth and gross out some of the women in the group. After leaving the sea creature’s home, we pass through a series of hallways and apparitions. Digital images of crew members and the ghostly captain are projected on smoke screens as we walk through – the same effect used at Pirates of the Caribbean in Disney Parks for Blackbeard. One of the last rooms in the ship is a room of neon skulls. Perhaps this is supposed to represent the crews decent into madness as bizarre creatures? A performer dressed in all black with a similar neon skull runs up to visitors as they exit. An outdoor attraction in the Santorini section is creatively titled, Flume Ride in English, a water coaster attraction. While the ride is not unusual to theme park connoisseurs, what does make the western visitor turn their head are the boat loads of Taiwanese visitors all wearing ponchos. Unlike the shorts and t-shirt archetype tourist to parks in the west, in Asia, many visitors dress to be seen when going to the park. 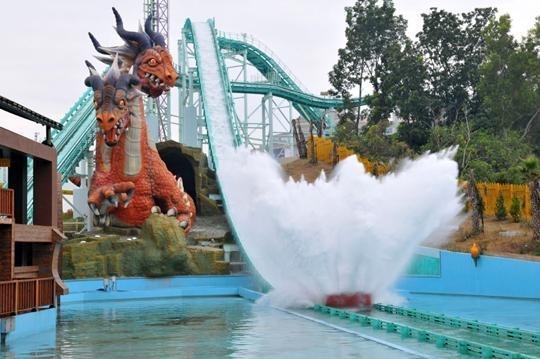 Additionally, many Asian visitors do not like environmental effects that are so common at many theme park attractions including spraying water or bursts of air on the audience. However, if one still wants to enjoy a water attraction, a poncho purchase is necessary. Theme park management not only provides a shop near the entrance to the queue to purchase ponchos as well as souvenirs, but an employee is also stationed near the boarding area for those that wait until the last second. Even on the hottest days, it is unlikely to see even a row of brave non-poncho wearing riders. 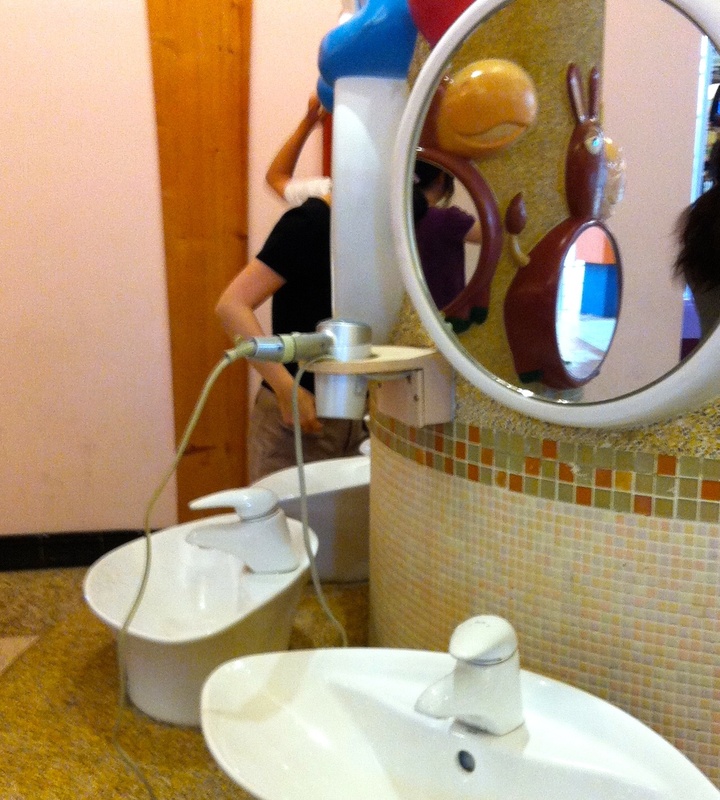 If the plastic did not protect one enough from being sprayed with water, the nearby restroom facilities offer blow dryers for the visitor to dry themselves off. Why even have a water ride if the majority of guests do not want to get wet? 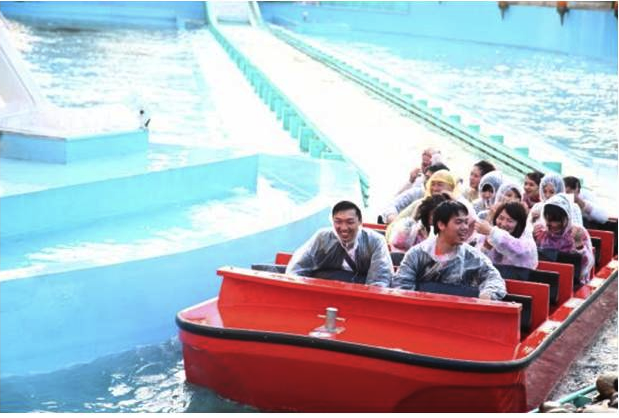 When asked, most Taiwanese responded, “Theme parks overseas usually have a water ride, so why shouldn’t ours?” It would appear that to the Taiwanese visitor, a water ride is an obligatory part of the theme park, whether one chooses to experience it with or sans-poncho. Below is an on-ride video from YouTube. As you can see there is no theming on this water attraction, even inside the mountain, except for perhaps that of a mine. Also, the splash down is quite large soaking everyone in it’s path. The ride also offers a photo opportunity for those who want a tangible memory of their plunge. The Trojan Palace is home to the majority of E-Da’s flat rides which are almost entirely indoors. Many of the younger kiddy rides are found here along with several carnival games booths. The Trojan Palace is also home to two of E-Da’s roller coasters, an inside kiddie coaster and a crazy mouse on the roof. 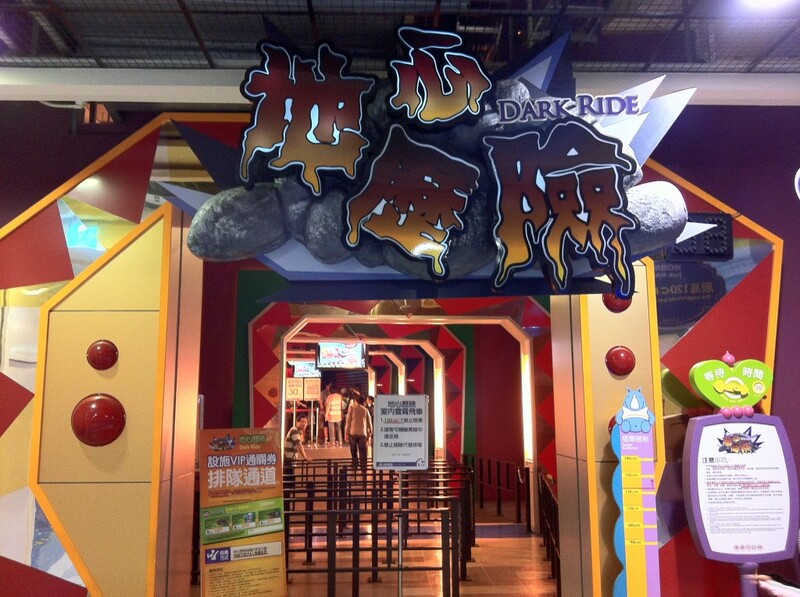 Simply called Dark Ride this junior coaster whisks riders through a darkly lit room. The key word here is lit, as this isn’t truly dark like Space Mountain or Universal’s the Mummy, the room containing the majority of the ride has light bleeding in from the loading area and the lift hill. The theming and feel of the attraction is somewhat Jules Vernian. The story that is conveyed is one of tunneling to the center of the earth in a giant drilling device. The lift hill at the end of the ride comes out of a rock, which travels through the atrium of the Trojan Palace enabling other visitors to see part of the attraction. Here we also see the giant Earth boring machine which has guided our path. Another oddity to the foreign visitor at Dark Ride and other attractions throughout E-Da are the unique boarding requirements. Along with the common height restrictions, many attractions also post signs requiring a certain number of riders to operate. For example, Dark Ride, must have at least 8 riders before the train will be dispatched; Flying over Taiwan, 5 riders; and Flume Ride, 6 riders. Even major attractions like Flume Ride have limited operating hours that do not match the park’s. By cutting back on operating hours of attractions, the park can save on labor, operating and maintenance costs. E-Da Theme Park typically implements these policies during the week when the park is at its slowest. 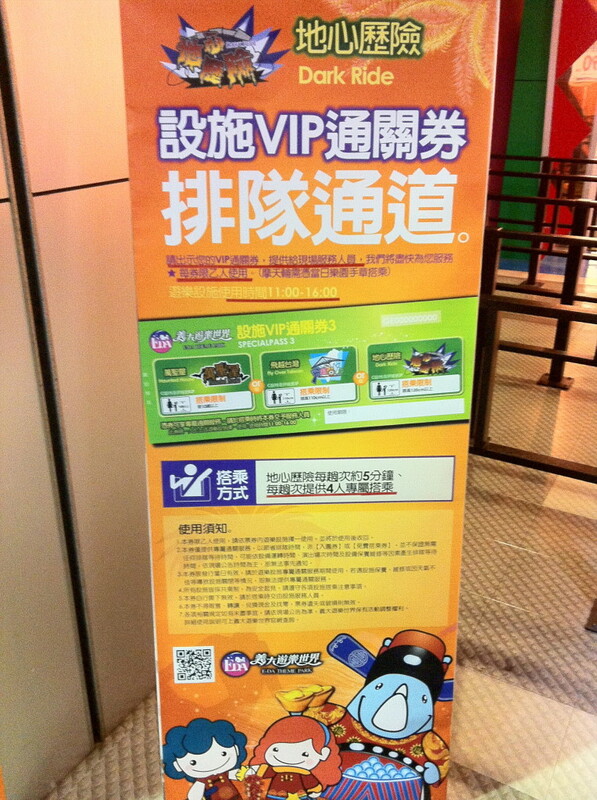 E-Da does offer a VIP Ticket which consists of three coupons in total and each offer the choice of one attraction. There are two ways to obtain a ticket: either purchase your E-Da Theme Park ticket online and receive a book containing all three or spend a cumulative total $15 USD in the park on souvenirs, food, drinks throughout the day to receive one book, or $30 and get two books. The coupon is presented to the attraction greeter and the guests are escorted past the queue to the attraction grouper. This is not your average FastPass, but more similar to a VIP tour guide “backdoor-esque” experience. The VIP Ticket is an example of conspicuous consumption, whereby the visitor is intentionally displaying not only their purchasing power to buy the VIP Ticket, but also that they have something the others in the queue do not. This behavior is particularly significant in a society and culture that places a lot of emphasis on acts of conspicuous consumption. For those who were unaware of the VIP Ticket and must suffer waiting in line, E-Da theme park offers in-queue entertainment. Overhead displays show an assortment of commercials, park information and cartoons containing the E-Da mascots. The cartoons involve Da-E and cohorts thwarting the plans of the evil Trojans, usually in some scatological way. Some of the cartoons even incorporate the attractions themselves into the stories, perhaps giving a backstory to an otherwise average looking roller coaster. Below is an example of one such video. Located on the roof of Trojan Palace is E-Da’s spinning wild mouse coaster. The intensity of the attraction is heightened by its placement on the top of a six-story building. With the exception of the loading/unloading area the cars constantly spin, including climbing the lift hill. Depending on the placement of weight in the car some can actually climb the lift hill with the passengers traveling perpendicular to forward motion, causing riders to look nearly straight down at the ground. Due to the constantly spinning nature of the cars, it is not uncommon to see riders become motion sick and need special assistance exiting the vehicles. Trojan Palace’s most popular and certainly most advertised attraction, Flying over Taiwan,which is similar to Disney’s Soarin’. While waiting in the pre-boarding area, visitors are treated to a safety video featuring Da-E. Afterwards, a video explaining how the attraction was filmed is shown. Special mention is made to the fact that the film was produced before the catastrophic Double 8 Flood which occurred in southern Taiwan in August of 2009 caused by the Morakot typhoon, killing over 650 people and destroying many natural parks and landscapes. Unlike Soarin’ at Disney Parks, Flying over Taiwan has three levels where guests board unlike Disney’s single boarding level. Every floor has three bench seats holding 5 visitors that are extended out into the imax-esque screen. Below is a promotional video from Vekoma and Brogent, the ride’s manufacturers featuring the same background music used in the attraction. Sadly, while the scenery is beautiful, the ride itself is disorientating and somewhat painful. The benches don’t glide like a hang glider, they violently tilt and shake. What should be a relaxing and exhilarating experience of flight, instead feels like being on a simulator through an abandoned mine. In addition,the film was obviously shot with no understanding of the scale or size of the screen it would be shown on. This creates a very distorted image. Also, it was obvious that different types of aircraft were used to film the sequences, as some scenes pass like a fighter pilot over a stadium while others are as slow as a bird in flight. An additional problem is the vehicles rarely synchronize themselves to what is occurring on the screen. It was not uncommon to see people leaning or grabbing their armrests as they squirmed in their seat, as if trying to command the seat to turn in the direction of travel. Taiwan, while being isla formosa, does not have many instantly recognizable sites. Certainly they have Taipei 101, former tallest building in the world, among others that Taiwanese residents would recognize. For a majority of the film, many natural sites appear undistinguishable, hence editors included subtitles at the very bottom of the screen for the geographically uneducated to know where they are flying over. Taiwan is truly a beautiful country, but suffers from heavy air pollution. Some is domestic, but more is blown across the Taiwan Strait from China. Segments of the film have their visibility and awe lost by the air pollution limiting the distance one can see. Despite all its flaws, Taiwan Formosa is still Taiwan’s only Soarin’ style attraction and for Taiwanese, it serves a patriotic need. Here is the best on-ride video of the attraction. Pay attention to the opening music and how similar it is to Disney’s Soarin’. Join us next time as we wrap up our series on E-Da. We’ll take a look at some of the finer details of the park including costumes, restaurants, overall operation and how I-Shou University might be the best place to learn how to operate a theme park in Asia. Until then, I’d like to hear your stories of visiting international parks and their attractions. For more stories like this, please follow Theme Park University on Twitter or like our Facebook Page. This entry was posted in International Parks, Theme Parks 101 and tagged 3D Ship of Souls, android, Brogent, creative entertainment, e-da, Morakot, ponchos, santorini, Soarin', soaring, Taipei 101, Taiwan, Taiwanese, Taroko, Trojan, 義大世界，高雄，義大，樂園，迪士尼，飛越台灣，飛機，雲霄飛車，鬼，鬼屋，迪士尼，台灣人，義大，卡通，八八水災，台北101，. Bookmark the permalink. Trackbacks are closed, but you can post a comment.